Fuseworks Fusible Glass Embellishments save you time and minimize waste for all your fusing projects. They can be fused in either the Fuseworks Microwave Glass Kiln or any conventional kiln. All shapes are COE-90 compatible. 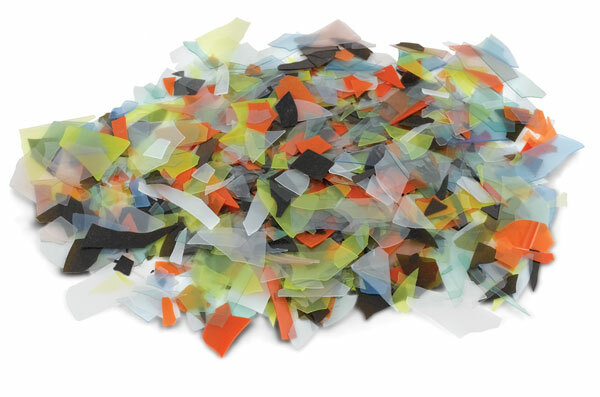 Dichroic Glass Pieces — This assortment contains glass that exhibits two different colors depending on the angle of view. It is great for accenting. The assortment is packaged in a 1 oz (28 g) bag. Glass Confetti — This assortment is packaged in a 2 oz (56 g) bag and contains paper thin glass shards of various, assorted colors. ™ Fuseworks is a trademark.® Diamond Tech is a registered trademark.